From Croydon to a world downhill mountain bike title via Wales? She was born in Croydon, spent a decade in the French Alps and now lives in rural Wales. Just like the reigning downhill mountain bike world champion Rachel Atherton, Tahnee Seagrave has found the Welsh hills offer the perfect training. The 22-year-old, who won the junior World Championships in 2013, is having a breakthrough season on the elite downhill circuit. She won her first World Cup in Austria in June, before following it up with a second in Canada in early August. "I moved to Wales about three years ago. Obviously you can't do much riding in the Alps in the winter!," she tells BBC Wales Sport. "Mountain biking is a bit bigger here than in other places. There's such a good group of UK riders [in Wales] and we all thrive off of it." Parked next to the Seagrave family home is a camper van. The initials 'F.M.D.' plastered on the side stand for 'Follow My Dream', the team set up by her father, Tony, in 2009 to support her in her goal of becoming world champion. Tony drives the camper to the European World Cups and worked tirelessly to get his daughter her first mountain bike and sponsors. "Dad's always said that there's not much support for females in the downhill [mountain bike] industry," says Tahnee. "There aren't loads of riders at this level and he just thought it'd be the best way to come through as a rider - and he wasn't wrong." There's also another Seagrave on the team - Tahnee's younger brother Kaos races on the junior downhill circuit. Tahnee Seagrave: Britain’s next mountain bike world champion? He and Tahnee have been included in the British team for next month's World Championships in Australia. "I definitely want to win in Australia," admits Tahnee. "But it's going to be so hard. It's a tough track and all the girls are riding so well." Back in 2004, a nine-year-old Tahnee Seagrave watched Vanessa Quin win the downhill mountain bike World Championships just minutes from their home in France. Since then she's wanted to do the same. But she describes her rise in the sport as a 'slow progression'. "I never won anything when I was younger. I always quite far behind," she admits. "But I could see my time getting closer and closer to the person who was always beating me. "So that was a nice feeling and I just kept going from there." That offers an insight into the determination behind Seagrave's eyes. Which, off the bike, she has no problem surrounding in mascara. "I do like the fact we are women doing this gnarly bike stuff," she says. "I love doing girly girl stuff. I love going shopping, I love going to the spa and getting my nails done. "But at the same time I love doing a jump that boys can't do." One of the sport's most successful women is Rachel Atherton, the 29-year-old whose two-year World Cup-winning run ended through injury in June. Since then Tahnee has won two of the last four World Cups and overtaken Atherton in the overall rankings. The Atherton family used to visit the Seagraves at their home in Alps and the then teenage Tahnee was already looking up to Rachel. "I thought what they were doing was incredible and wanted to be like that one day," recalls Tahnee. "What Rachel did [in becoming the first rider to win all World Cups and the World Championships last year] was unreal. "People remember people who dominate and I wouldn't mind having a couple of seasons in a row being the best in the world." The third elite female rider in the British World Championships team was Manon Carpenter. But the 24-year-old from Caerphilly recently announced her retirement, citing concerns over the consequences of crashing. Speaking before Carpenter's decision, Seagrave admitted she finds it an unnerving sport at times. "I still get so scared," she admits. "I go down these horrible paths in my mind and you start thinking badly. What if I end up in hospital? What if I break my neck? "But the feeling when you actually do it makes yourself proud. You have that fear and then conquer it. There's no better feeling." 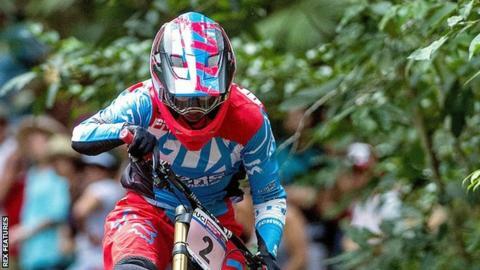 The 2017 UCI Mountain Bike World Championships take place in Cairns, Australia from 5-10 September.